Take it Outside | The Kids Beat | Kids VT - small people, big ideas! Students at Burlington's Sustainability Academy at Lawrence Barnes are getting down to work — outside the school building. The magnet elementary school recently unveiled an outdoor classroom where students can experience hands-on learning in the natural world. It's the first step in transforming the urban school grounds into a little oasis in the Old North End. The new, open-air veranda is fashioned from massive larch logs — rot resistant, incredibly durable and sustainably harvested in Vermont. The result is part classroom, part playground, where kids can pile onto the benches for a lesson or scamper across benches-turned-balance-beams after school. The school's biggest champions say that what might look like a cosmetic upgrade is, in fact, a sign of Barnes' momentum and growing success. "This isn't just a school. 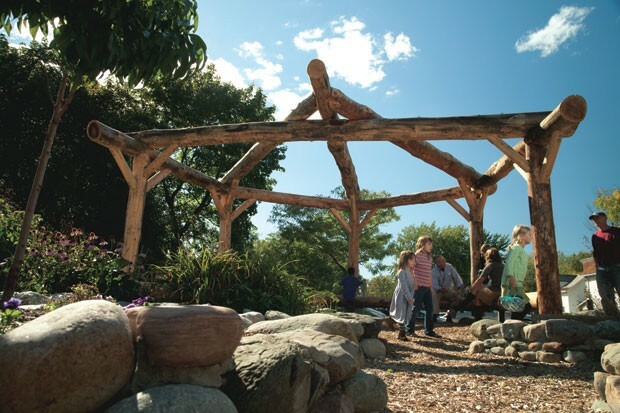 It's a model of what change in a school can be," says Chris Sharp, a Burlington High School art teacher who helped design and build the outdoor classroom. "This is the most vibrant change I've ever seen made in a school." Outdoor classroom: Located at the Sustainability Academy at Lawrence Barnes, 123 North St., Burlington. Info, 864-8480, sa.bsdvt.org.